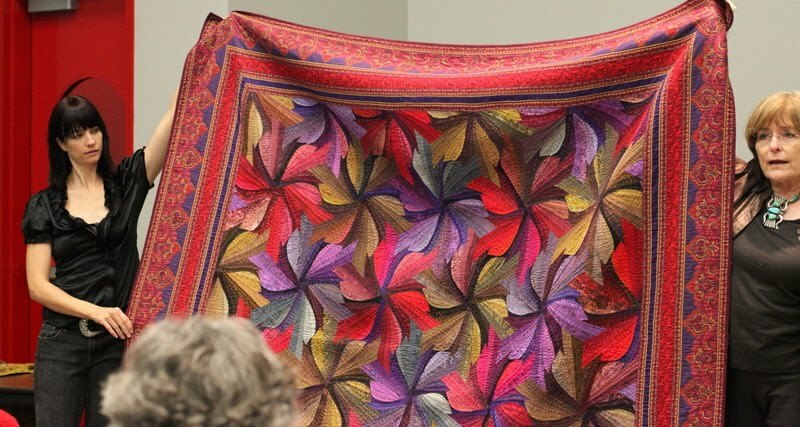 Jinny Beyer has worked in conjunction with RJR fabrics for many years and her Palette is a fantastic basics range to have in your stash - the Snowbirds quilt (above) is a great example of how the whole range of 150 fabrics goes through the spectrum. Back in 1996 Jinny visited The Cotton Patch and at a lecture to 200 quilters in the Solihull Civic Hall (subsequently remodelled as John Lewis at the Touchwood Shopping Centre!) described how to use the palette effectively. 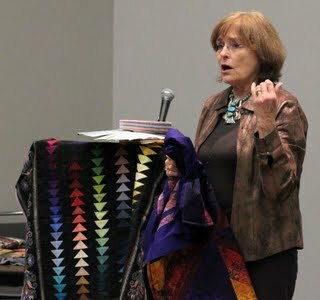 At Quilt Market Jinny described how you can use any 8 fabrics that are next to each other in the Jinny Beyer Palette and create an interesting quilt that has the essential ingredients of a "Deep Dark" and an "Accent". 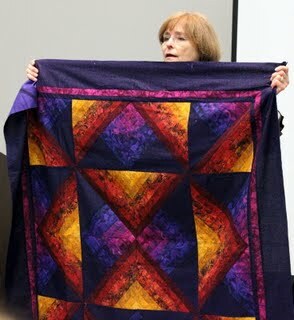 She demonstrated this by showing quilts that did not have these features and asked the audience to vote on their favourites. Consistently the result was that the quilt with those ingredients was favoured even though the majority of the other colours were there. 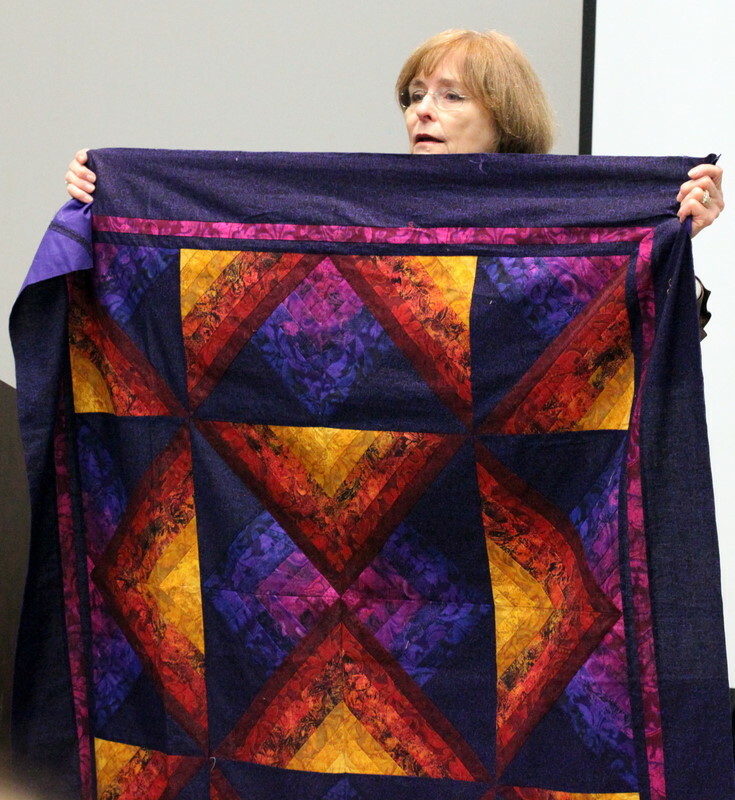 She also showed that a quilt that has a co-ordinating border does not have to have fabrics within it that are absolutely identical to the fabrics in the border. In fact interest is created by the eye creating the "leap" itself! Finally the kind of fabrics that don't jump out at you as being "gorgeous" in their own right can showcase other fabrics. For example, I'd never pick khaki as a colour for a quilt but if you look at the vibrant quilt above you can see how the khaki actually highlights the vivid purples, reds and pinks and makes them come alive and stand out. Colour and selecting fabrics for quilts can be daunting for many people. Playing with colours and using tools and experience of others to guide you can be a real help- why not check out Jinny's website with her tips on colour to give you some ideas for experimenting and going outside of your normal palette. Most importantly have fun - design walls are a great way to see how fabrics can work together - pin an old flannel sheet or the Clover Design Wall to a wall and stand back from it to see the effects of different fabrics. A more computerised approach is to use software like Electric Quilt - EQ6 to play around with colour combinations at the touch of a mouse button! Very good information. That you for sharing with those of us who weren't there. I have a more informal method: every beautiful quilt has to have one ugly fabric. I guess that is sort of your khaki example, but MUCH less formal. You're absolutely right - the ugly fabric is a key feature and let's face it even though we didn't intend most of us can find a few "ugly" fabrics in our collections so its a way of using them up!